Chocolate crust, mint cheesecake filling, chocolate glaze. 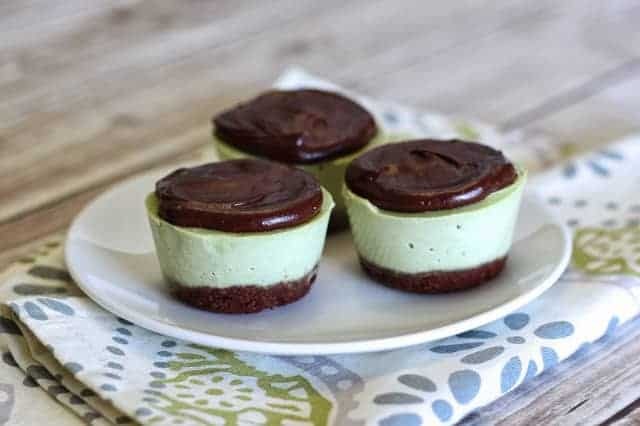 And these mini cheesecakes are perfect for St. Patrick's Day thanks to a little spinach. When it comes to celebrating St. Patrick’s Day, it’s all about the green desserts! You could use the standard green food coloring and make just about any dessert green. I’m not a huge fan of using food coloring, if I don’t have to. Some kids really have to avoid it, but really we all should. Nothing artificial can be good for these bodies that God gave to us. 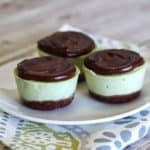 See those teeny tiny mint chocolate mini cheesecakes? They are only green because I snuck in a handful of spinach in the blender. Get your greens when you can, even in dessert. The spinach gives it a subtle green color, but no noticeable spinach taste. I promise, your kids will never know you put veggies in their cheesecake. My daughter was raving over how good these were! I started with a simple crust made from gluten free oats, nuts and cocoa. Bake for a few minutes and I was off to blend up the creamy, minty cheesecake filling. Cashews rock my world when it comes to cheesecake. So dreamy. There is also no refined sugar in this recipe, my friends. Even in that glorious chocolate glaze! You really can’t enjoy these mini cheesecakes without that glaze. Chocolate crust, mint cheesecake filling, chocolate glaze. Three layers of gluten free vegan yumminess. I’ll take three, please! Preheat oven to 350 degrees. To make crusts, place oats and walnuts in food processor or high-powered blender. Grind on high for 1 minute. Add coconut powder, melted coconut oil and maple syrup. Continue to blend until combined. Divided crust evenly into greased mini-muffin pan or mini cheesecake pan (I used a non-stick silicone mold). Bake for 8-10 minutes. Allow to cool completely in the pan, while you make filling. Soak raw cashews in warm water for 30 minutes. Drain. Add soaked cashews, coconut milk and coconut oil to food processor or high-powered blender (I used my Blendtec). Blend on high for 1-2 minutes. Add maple syrup, spinach leaves and salt. Continue to blend on high until smooth and creamy. Pour in vanilla and peppermint extract. Pulse until combined. Pour mint mixture into pan, over the cooled crusts. Cover and carefully place in freezer for 1-2 hours to become firm. To make chocolate glaze, mix together cocoa powder, maple syrup and coconut oil until smooth and creamy. Add an additional 1-2 teaspoons of maple syrup, if needed. Remove from cheesecakes from freezer. Carefully remove cheesecakes from pan. Spread or drizzle chocolate glaze over cheesecakes. Serve chilled. Store in air-tight container in refrigerator or freezer. This entry was posted in Baked Goods, Desserts, Recipes, Recipes & Techniques by Cooks We Love, Vegan and tagged autism, autism diet, autism gluten free, autoimmune disease, celiac, celiac health, food allergies, g-free diet, gluten allergy, gluten free, gluten free baking, gluten free diet, gluten free dining, gluten free food, gluten free holiday, gluten free mommy, gluten free parent, gluten free parenting. Bookmark the permalink.